Now that I've been working longer and longer days, I've been looking for makeup that lasts as long as my time in the hospital does. Below are the products, methods, and tricks I've found that work for me! While my makeup didn't exactly last through a 28 hour shift, it does hold up for 12+ hours! No matter your skin type, using a primer is the vital first step to getting your makeup to last all day. There is a whole range of primers out there that address all and any of your skincare concerns. For me, I need something that is hydrating. 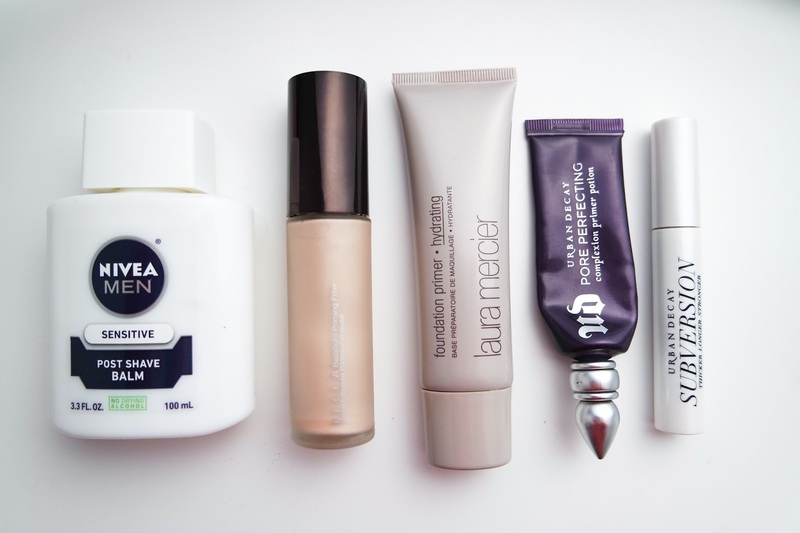 My staple is the Laura Mercier hydrating primer, but have also enjoyed using Nivea's post-shave balm (review here), Urban Decay's Pore Perfecting primer, and Becca's Backlight Priming Filter. I would really like to try Too Faced's primer, partially because of the good reviews and partially because the packaging is so cute! Unfortunately, since I do not have experience with oiler skin, I don't personally have any recommendations - if any of you do and have found a primer that works well for oiler skin, please share below in the comments! I personally rarely use an eyeshadow primer - I find that using my face primer on my eyes is usually enough to stop my eyeshadow from migrating and creasing, but I also don't wear a ton of eyeshadow during the workweek. This may not be the case for you if you have oilier skin though. I do own the Urban Decay eyeshadow primer, and it's the perfect primer for nights out when I go a little heavier with the eyeshadow. And for those of you who have issues with mascara fallout, you need to try a primer! I'm a big fan of the Urban Decay primer, and just ordered my second tube. Not only does it keep your mascara right where you want it, but it makes your eyelashes look almost fake they are so big (see here for proof!). If you are looking for something a bit more inexpensive, try the primer side of L'oreal's Double Extend mascara. Estee Lauder's Double Wear Light: I've heard great things about their Double Wear foundation, but since I didn't want a full coverage foundation, I went with the lighter coverage version. I plan on having a full review of this in the coming weeks (completely with 12 hour later pictures! ), but let's just say that this stays right where you put it. Highly recommend! 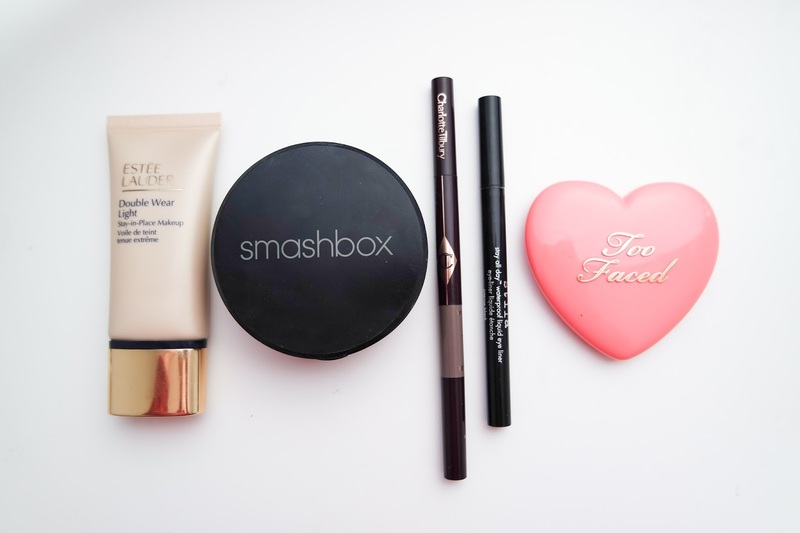 Smashbow Powder: I seem to work this into every beauty post, but that's because it is one of my absolute favorite beauty items. Not only does it even out your skin, make your pores disappear (truly! ), but this is what sets all the rest of your makeup. I've purchased...probably at least 8 of these over the years. Brow Pencil: I used a brow powder for years before switching to a pencil. They say that powders look more natural, but I find that with the right pencil and technique (you have to use the spooley! ), not only will your brows look "natural" (but better, obviously), but they'll also be there by the end of the day. I'm currently using Charlotte Tilbury's Brow Lift, but if you are looking for something with a few more colors, Anastasia recently came out with a similar product with more color options. If you are still noticing that your eyebrows are disappearing, try a brow gel after coloring in your brows! Stila's Liquid Eyeliner: It says it right in the name - stay all day! Another one of my holy grail items, I've purchased probably at least 20 of these, and the day I find out they discontinue it is the day I order 20 more online. This truly stays on my eyelids all day long - through allergy season, sad movies, and afternoon naps. Too Faced's 16 hour blush: A recent discovery, this blush not only comes in adorable packaging, but lives up to its name. It gives you just the right flush while staying put all day. This is fairly new to me, but I've been using Urban Decay's setting spray for about six months now, and have actually noticed quite a difference! Once all of your makeup is applied, apply your RBF (so that your face is neutral, unless you are lucky and don't have RBF like I do), and spray one-two pumps on your face. Wait about 15 seconds for it to dry before talking or really moving your face, otherwise it will settle into the crinkles of your skin. 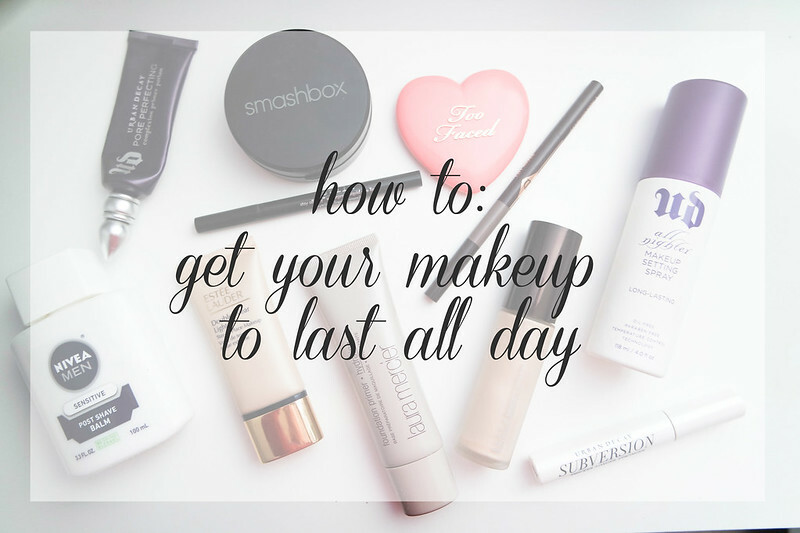 I hope that helps getting your make up to last all.day.long! If you have any tips, tricks, or products that have helped to increase the longevity if your makeup, please share below in the comments!